USGS made 1.5 or 3.0 m gridded DTMs and 0.5 m orthomosaics for 20 of the 50 CxP regions of interest using LRO Narrow Angle Camera (NAC) images (~0.5 m/pixel resolution). Additionally, 3 or 5 m DTMs and 1 or 1.5 m image orthomosaics for 3 sites were produced from digitized Apollo Panoramic images. The requirement was to produce DTMs covering at least a 10 by 10 km region (100 sq. km) with a goal of covering 20 by 20 km (400 sq. km), and an orthomosaic for a 40 by 40 km region (1,600 sq. km). 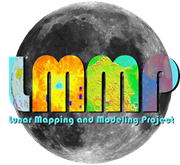 The DTMs and othomosaics were geodetically controlled using Lunar Orbiter Laser Altimeter (LOLA) spot elevation measurements (based on LRO Planetary Data System (PDS) release 5 March 2011). The Apollo Panoramic DTMs are lower resolution, but cover a larger area at each site (3,276 ± 718 sq. km) than the DTMs produced using the LRO NAC images (558 ± 175 sq km). The Apollo Panoramic orthomosaics cover the same area as the Apollo Panoramic DTMs and the LRO NAC orthomosaics cover a larger area (1,433 ± 123 sq km) than the LRO NAC DTMs.